I grew up in the suburbs of Cleveland. I wouldn't eat mushrooms for a long time after my brother told me, (while eating mushroom soup), that mushrooms were a fungus...just like that white stuff you find on sticks outside. Ewwww. 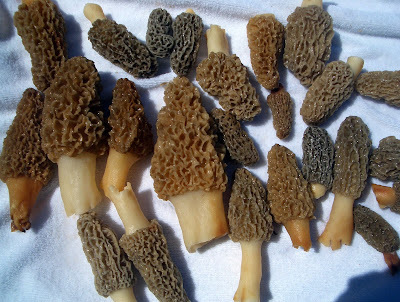 I had never heard of morels until moving to Illinois when in the spring everyone has a story of how many hours they spent hunting for mushrooms and how many pounds they found. 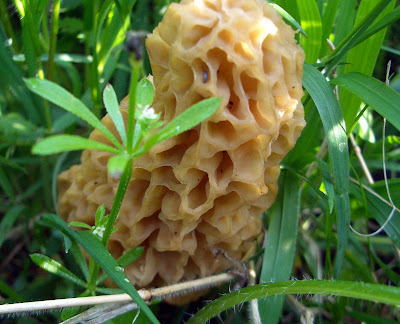 Two years ago I ate my first morel. It was sauteed in butter and I immediately fell in love. I love mushrooms! So, this year I made it my goal to hunt for my own. I went out on Saturday with a seasoned hunter and after two hours and 4 stops we didn't find any. Sunday morning (happy mother's day) I slipped out of the house at 7:30 in the morning and walked down into the woods beside my house. I was determined. When my eye spotted this group it sunk in excitement. There were 2 more just beside them. I was taught to look under or around dying elm trees. 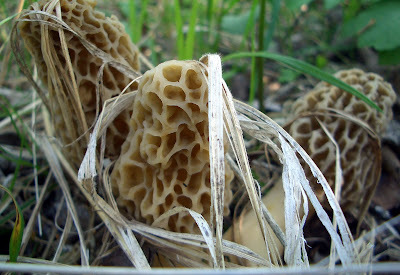 But this huge morel was just laying in some thick weeds and ground cover. I found several more in the same area. I soaked them for a few hours in salt water and then set them out to dry for a while. Here is the lot of them! I made spaghetti for dinner and sauteed half of them. M, P, and I loved them. S is much like his father in that he will NOT eat a mushroom. Oh well, more for the girls! Um...they're pretty! ;-) I love the taste of mushrooms, but not the texture so they have to be TINY little pieces before I'll eat them. Yum! I had a mushroom aversion during my early pregnancy and I am happy to report that I am once again drooling over mushrooms. Congrats on your find. Wow! These are amazing. 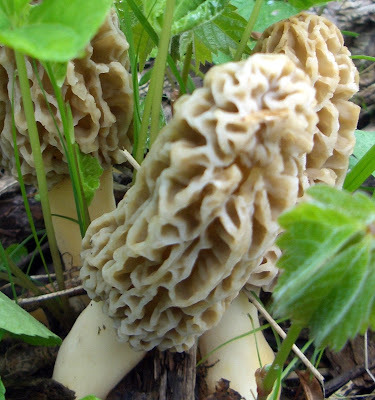 I have heard lots of Morel stories, but I have never had them myself, though I am a mushroom eater. But - I have heard - they are supposed to grow back every year if you cut them off instead of pulling them up. 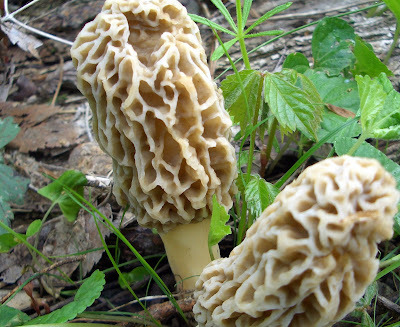 You certainly can supply wild mushrooms. Nice Find!